Product #22149 | SKU TS-RDP5K | 0.0 (no ratings yet) Thanks for your rating! 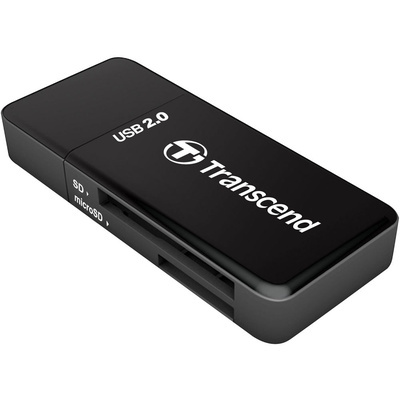 The black Compact Card Reader P5 from Transcend is equipped with a USB 2.0 interface for fast, easy transfer of data from your memory card to your computer. It's compatible with SD/SDHC/SDXC cards and microSD/SDHC/SDXC cards, including UHS-I. The device has LED lights that indicate a card is inserted and that a data transfer is taking place. The unit has a removable protective cap that guards the USB connection.